I was a little skeptical about this technique at first, but once I figured out my colors of ink, this card was the QUICKEST card to make EVER!!! :) So, today we all tried a technique called "Cluster Stamping!" Basically all it is just stamping randomly over an embossing sentiment that was embossed using clear embossing powder! To learn how to do this technique, you can see it here! I had to think a little outside of the box for this because I first stamped the stamp that had the starts on it, but I realized that it had to be a solid stamp! 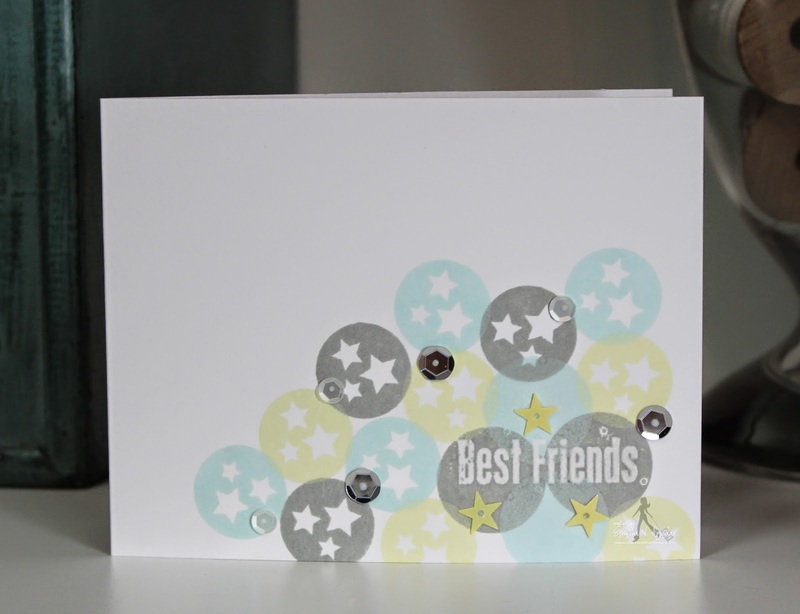 So, I just turned that same circle star stamp upside down & used the other side for my solid circles! Did my team & I inspire all of "YOU" to do some cluster stamping today? :) Well, I sure hope so!!! Hey Good Morning Miss Emma love your card and actually glad you messed up because thanks for the idea of flipping the stamp....never would've thought of this but hey two stamps in one.....your card turned out so fab. Super great stamping idea and am so going to use your idea on a LO will make a great background.....love your super clever and creative ideas always for using your goodies.....and your neat tricks and tips......can't wait to give this a try. Have a fun day with your baby boys......enjoy your day!! What a pretty card Emma!! I love the soft colors and what a fabby idea to turn the stamp over!!! Hugs!! Beautiful card Emma, the colours are fantastic together!!!! Love this technique!! I am going to have to try it tonight! Thanks for the great ideas. Love these cards. I will definitely have to try that technique. So pretty!! I want to try this...thanks for showing this technique I had not seen before. I like how you used the stamp back for a nice solid stamp...great idea. You and the wonderful Design Team have beautiful cards to share using the technique and they all used different stamps. Super job everyone! This is a cool technique! Looking at all the beautiful cards, this is something I want to try. Thanks for the inspiration girls! This is AWESOME Emma!!! What a GREAT technique and AMAZING card!! Will have to give this technique a try for sure! Everyone did fabulous on their projects! This sure looks like a technique I want to try! Going to check out that video link. Thanks for attaching!